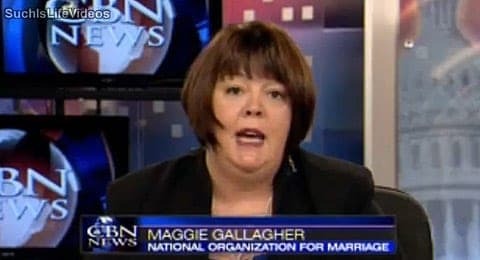 In an exchange that really crystallizes the tremendous progress gay rights has made, National Organization for Marriage founder Maggie Gallagher shared her thoughts with The Huffington Post about losing the marriage battle, writing "I have a lot more freedom now to figure out what I want to do with the next 20 years of my life." I went into this fight, in good conscience, because I believed it mattered and that I had something to contribute. I did not promise myself I would win. I promised myself I would do everything I could see, to do this good, to fight for marriage as a universal human institution with certain goods and goals. I feel a great deal of contentment about that. I can see some things I might have done differently, but basically I was at post. One cannot do anything better with one's life than stand up for what you deeply believe in, i.e, to speak truth, whether in power or to power. She went on to share her thoughts on religious exemption legislation like the failed proposal in Arizona and why she thinks there has been a such a dramatic shift in public opinion among religious groups regarding LGBT rights. You can check out the full, fascinating interview HERE.